We had some rain showers last night that were just enough for Phil to close the hatch and me to put up the side panels and close the dodger window—and then stop. After a while we opened the forward hatch, and kept the fan on. 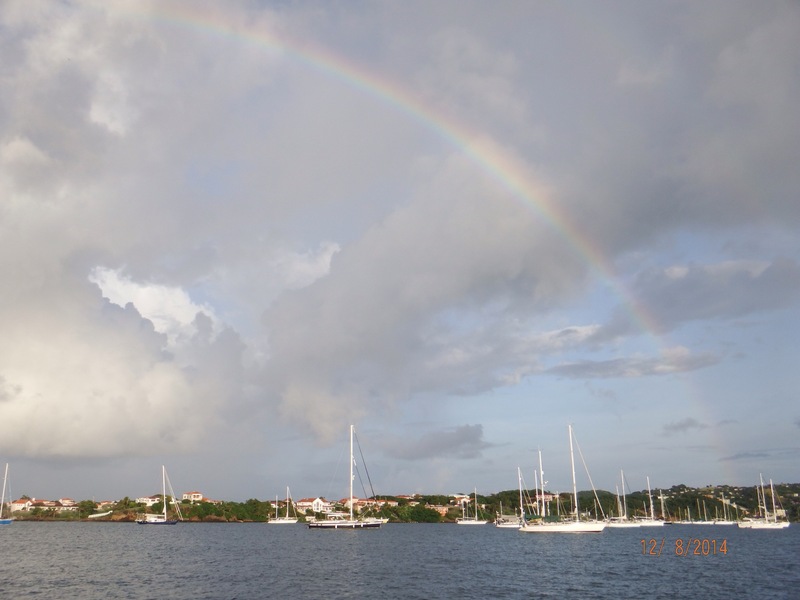 Early this morning, after a few more rain showers, we had a rainbow across the anchorage. We listened to Chris Parker’s weather of the SSB and he came in loud and clear!! This past summer he put up a new custom antenna from Germany, a tower with rotator to rotate his beam. Well whatever he did works beautifully. Last trip we couldn’t hear him unless we had WiFi and listened on his web cast. Then we listened to the Cruiser’s Net and check emails and such on the iPads. I found that Verizon Wireless is billing us even after suspending on phones and iPads. Lucky for me I have the Magic Jack and good enough wi-fi that I was able to call them and get it worked out. Now to remember to re suspend on March 9. We left at 930am to go to Jenny Farmer’s Market, but checked the pennant line to the morning ball for chafing, and found the line was half chafed through. It has been very calm so wasn’t a problem, but higher winds are expected in the next few days, so we took our new dock line, removed them from the pennant line and out them around the metal loop on the mooring ball. Phil will check under the mooring when we come back. So we got a 20min late start to the market, but walked there through the shortcut Inga showed us and arrived at the right time helping Jenny unload her SUV. 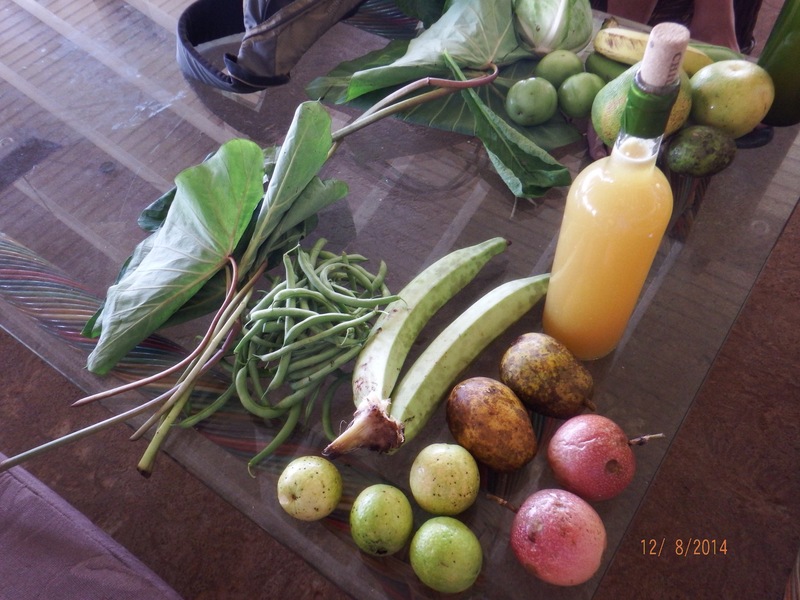 I purchased Balloloo, guava, passion Fruit, golden Apples and golden Apple juice, plantains and green Beans. Phil’s not sure of the tropical veggies and fruits so have the green beans for him. Here is the photo, but also added a green golden apple and freshly dug ginger. Ballaloo are the greens on the left and is a cross between spinach and mustard green. They have something that can cause itching when fixing it, so I’ll wear some latex gloves just in case. The fruit smells wonderful hanging from the net hammock above the port settee. I really had to practice being patient on “Island Time” waiting for Jenny to come over for us to pay. She was talking and then got distracted but eventually it all worked out and while waiting, I enjoyed listening to a conversation between Kathleen, who I played dominoes with and Sherry, whose husband Jack had owned a claim on a gold mine in Alaska and then sold it and bought a catamaran and are now cruising. 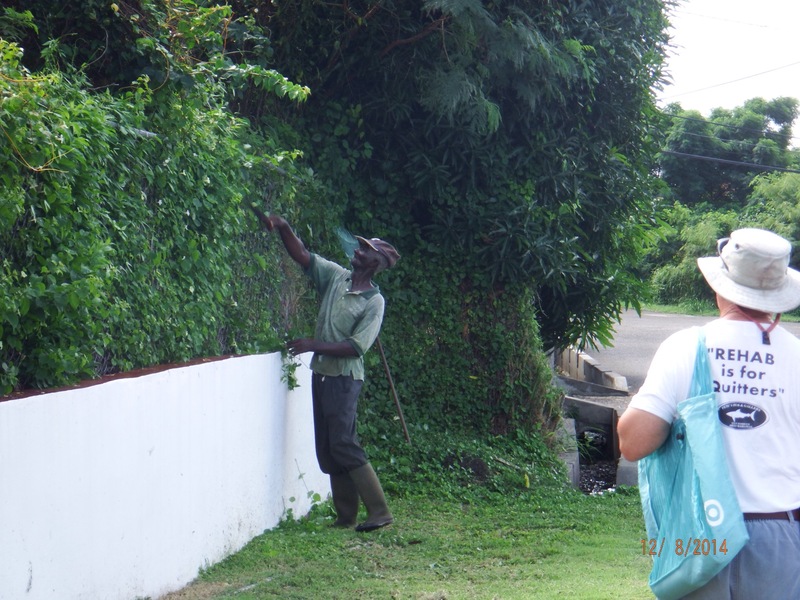 On our way back, a local was using a machete to trim the bushes to a fence. Our next stop was to talk to Peg and Rick on Vision Quest about lunch. They are now at the dock next to Timbers and close to Budget Marine to get some work done on the collar at the base of the mast which has leaked water and their new windlass installed. They will be ready to eat in 15 min, so we walked to Budget Marine to check out the cost of Blue jerry jugs for water. All our collapsible jugs are leaking, so we need to get something different. Phil had not brought the check in papers to show them so we don’t have to pay 37%VAT on purchases, so we’ll come back another day. At the Beer Garden Timbers, we had chicken Roti which was good but a little spicy for me, so was glad to end the meal with some french fries to absorb the spice offered by Kathy, Rick and Peg’s niece from Texas. We had a good time and Peggy and I enjoyed talking about our days as Girl Scout Leaders. Two of her girls went on to earn their Gold Awards, which are equal to the Boy Scouts Eagle Award. Peggy had also made quilts with the kids at school like I had done with my girls. Once back to Changes Phil checked the mooring ball, and it’s all chain attached to the anchor. We both took naps in the cockpit to take advantage of the cooling breezes. 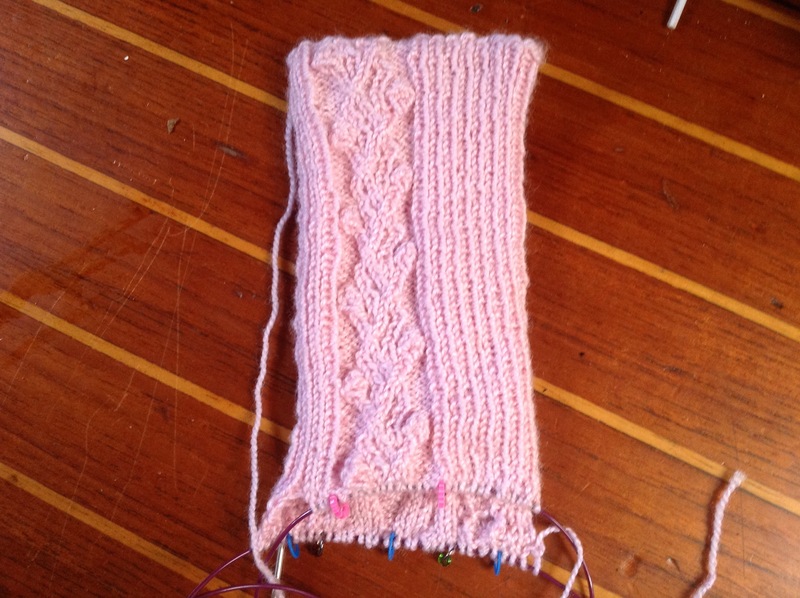 After I woke, I worked on knitting my pink sock. 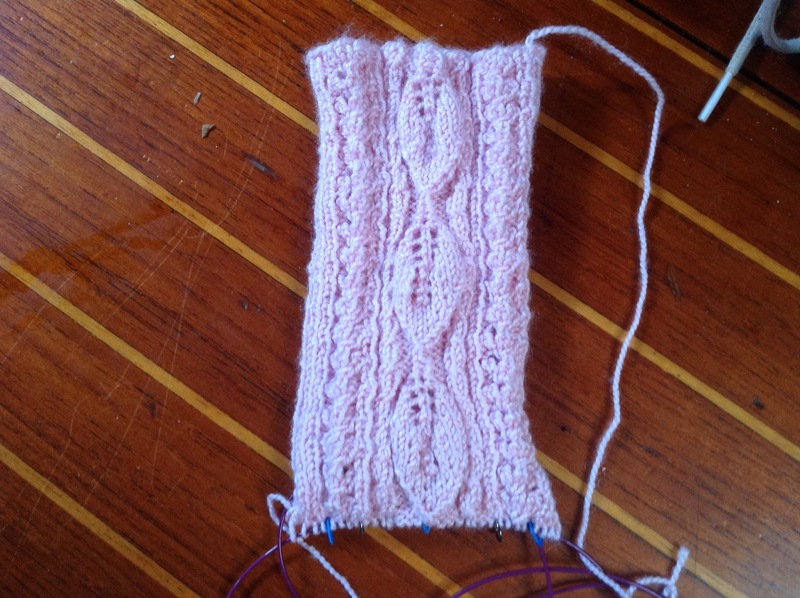 I’m getting close to working on the heel. The front is the Grapevine pattern. and the back is the leaf pattern. I forgot to tell you how we put a new screen in our toaster yesterday. I cut the fuel screen along the welded edge and opened it up. 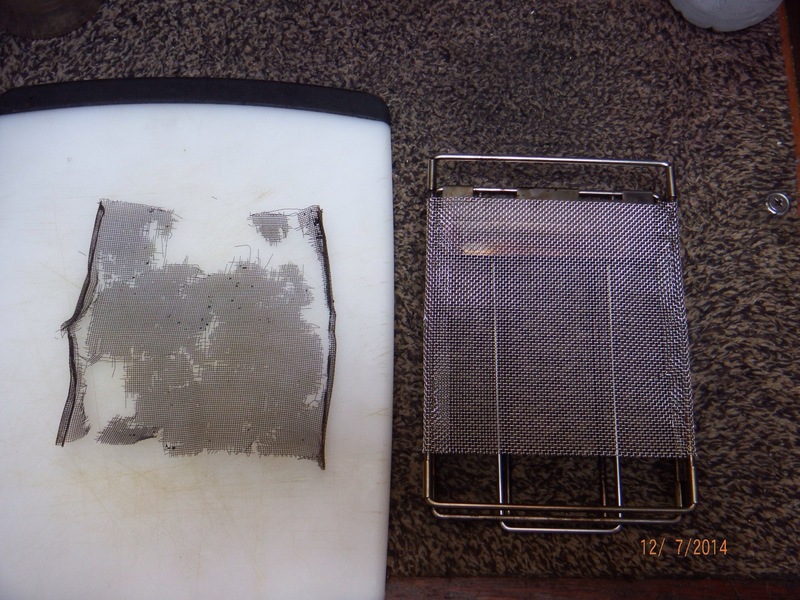 Then removed the old screen. Phil crimped it on with pliers and you can see from the photo that it looks good as new! We left at 530pm to go to the Tiki Bar for half priced pizzas. We got there early enough to take advantage of Happy Hour prices on drinks then found out that because it was the last day of the Nutmeg Festival there too, there were no discounted prices. As part of the festival, local bartenders were in competition to make the best rum, vodka, and non-alcoholic drinks. There was a band to play on the stage too. We saw Chris and Fran from SV Changes and invited them to join us for supper. Phil and I shared a Hawaiian Pizza which was very good. Later Peggy, Rick and Kathy joined us. We had a good time and left getting back to our boat Changes by 830pm. On our way back, we realized the temporary anchor light was not visible 360 degrees, so Phil moved it to the topping lift. I was on Facebook and Messenger and had nice chats with my daughter Rachel, niece Heather, Joanne Tillman and Nyla Snodgrass. Phil went to sleep before me while I worked a little more on my sock. I’m glad to say that Rachel is doing better and she’s very thankful to have her belongings from the move. 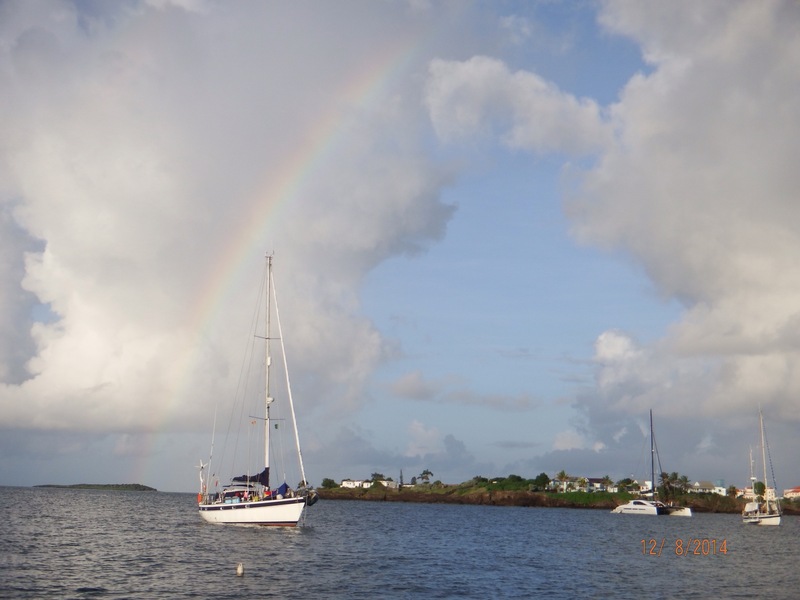 This entry was posted in 2014, anchorages, Caribbean, Cruising Events, Cruising Friends, Grenada, Knitting, Lorraine's Projects, Mast light, Provisioning and tagged Budget Marine, Chris Parker, Cruising friends, dinner, green Beans, jerry jugs, Pink socks, rain, rain showers, Restaurants, Roti, Timber's, Verizon Wireless, Vision Quest. Bookmark the permalink. Glad that all worked out with Rachel getting her belongings. Loving your blog and you!